This year, apparently for the first time, a small number of our bur oaks have acquired bur oak blight, a relatively new bur oak disease. 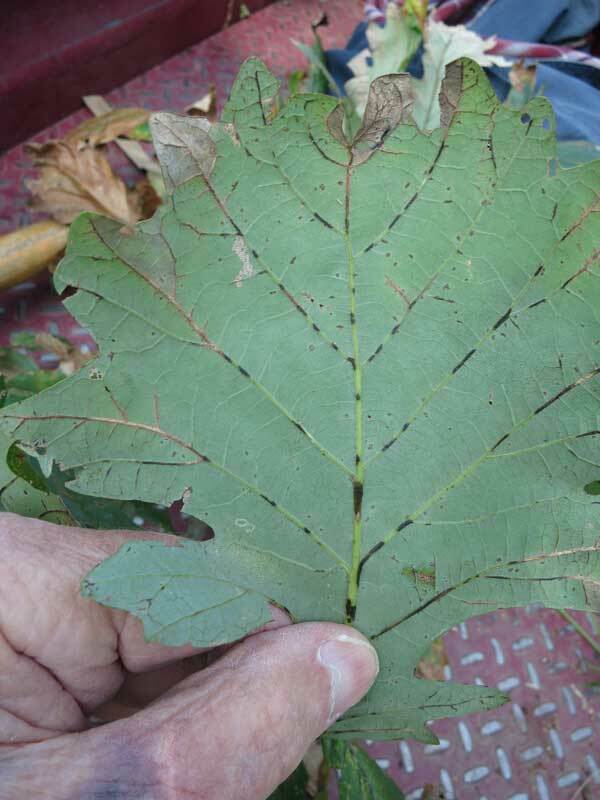 The disease is shown in the leaves and symptoms first appeared at Pleasant Valley Conservancy in early August. Infected leaves exhibit purple-brown lesions along the veins on the under side of the leaves. 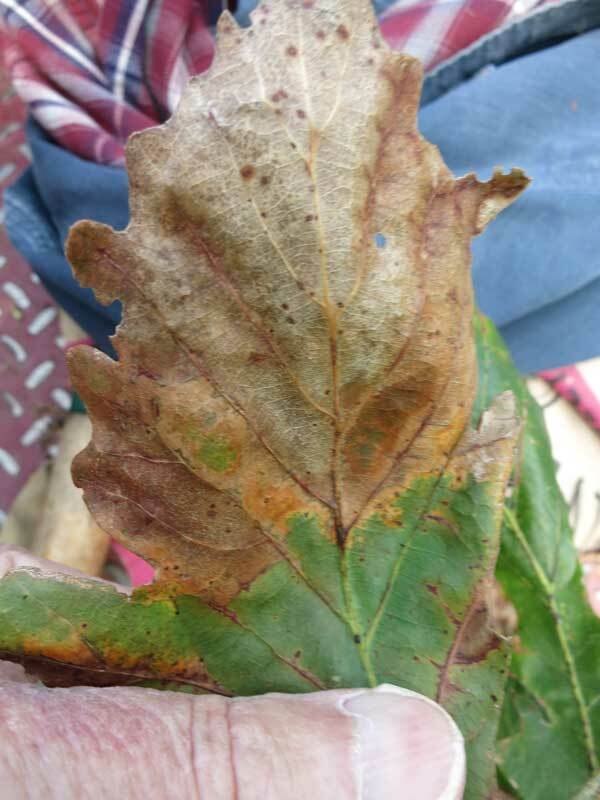 These lesions gradually expand and in many cases the leaf turns completely brown. During the summer, black fruiting structures of the causal agent, the fungus Tubakia iowensis, appear and are diagnostic for the disease. The disease was first discovered in Iowa by Harrington and co-workers in the 1990s, and is now known to be present also in Minnesota, Illinois, and Wisconsin. This is the first year we have noticed it at Pleasant Valley Conservancy. 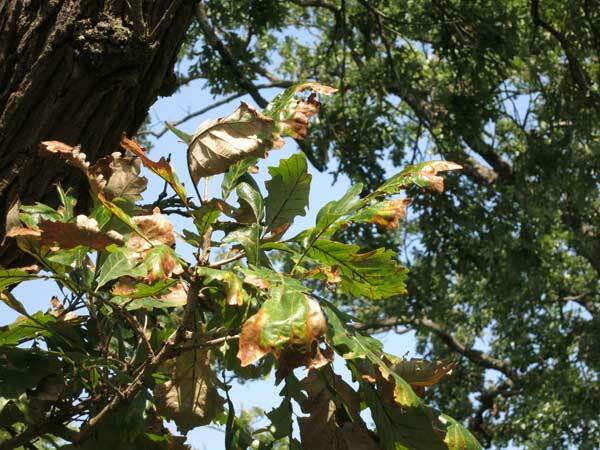 Apparently the disease occurs only on bur oaks. There are several subspecies of bur oak in the Midwest, and the disease has only been observed on Quercus macrocarpa var. oliviformis, a variety of bur oak that produces smaller acorns. Interestingly, it was because of this connection that we first noticed that some of our bur oaks are the small-acorn variety. It is not clear whether this new pathogen is a recent arrival to the Midwest, or whether a shift in climate may be responsible. Apparently the symptoms develop more commonly when the humidity is high. Since we had a rainy summer, this may be partly responsible for its presence at Pleasant Valley Conservancy. To be certain that we did indeed have bur oak blight, we had infected leaves analyzed at the UW-Madison Plant Disease Diagnostic Laboratory. The report was positive for blight but negative for oak wilt, a more common oak disease (but not very common in bur oaks). To get an idea of the extent of the problem at Pleasant Valley Conservancy, I had Amanda and Susan do a survey of our bur oaks. It is fairly easy to recognize an infected tree because of the presence of brown leaves. Since each tree in our database is numbered, and we have its GPS coordinates, I was able to create a map showing the distribution of the disease. As the map shows, most of the infected trees were in a single location, at the upper edge of the North Woods (Units 15 and 19B), and nearby in Units 8 and 10. 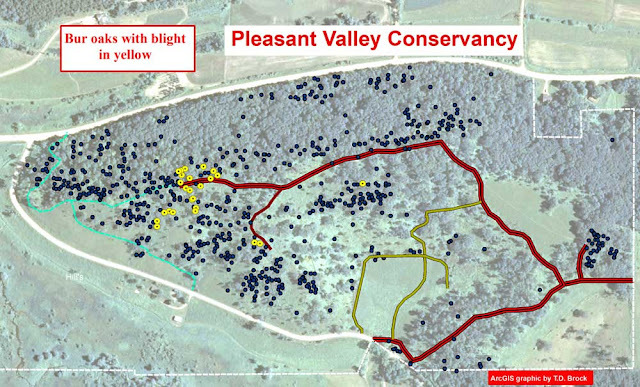 The blue dots show the distribution of bur oaks at Pleasant Valley Conservancy, and the yellow dots are those that are infected. The red lines show the location of the Service Road. We will of course be monitoring our bur oaks next year and later. We hope that the disease is not fatal, because one of our patriarch bur oaks at the top edge of the North Woods is heavily infected and is defoliating.